Getting in on the best of what is fresh in Armstrong is more than a good idea. 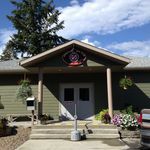 The businesses and attraction feature the best Armstrong has to offer, which in turn makes for a wonderful stop over during any BC travel plans into the area. Armstrong is charming, warm and friendly, which of course are all good traits, but even better are the seasonal activities put on in the community (ei. fall fair IPE in Sept and the winter festival in Dec.). Plus Armstrong has interesting perks such as; cheese factory tours daily, llama farms, first class theatre performances, art galleries, guided nature walks, the historic town centre and shops, and regional train tours and the power club (covering the areas engineering history). Much of these activities are on hand and available (seasonal as mentioned) to the public and visitors upon arrival. Armstrong-Spallumcheen Memorial Park orientated for the whole family, playground, skate park and summer time outdoor pool. Cooke Creek - swimming holes & nature trails, Cooke Creek Rd for hiking trails. Bei uns finden Sie alle Einrichtungen, die Sie für einen Zelturlaub brauchen und erwarten.